Problems caused to heavy rainfall throughout our region may soon start to show up in gardens and landscapes. These include treatable problems like leaf spot, yellowing leaves due to nitrogen deficiency, and more serious problems such as root rot and southern stem blight. Most plant diseases require moisture to infect and spread and are therefore worse during wet weather. This is especially true of leaf spot diseases, which are easy to recognize by the circular tan, brown or purple spots they cause on plant foliage. On ornamental plants, leaf spot diseases are typically just a cosmetic problem, though a few are more serious. On vegetables, leaf spot diseases cause greater concern since they often result in reduced yields. 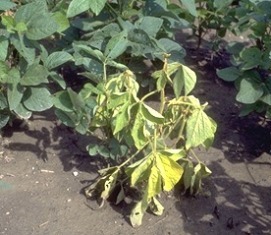 Most leaf spot diseases are very specific, only capable of infecting a few species of plants. When a plant in your yard develops leaf spot, you usually do not have to worry about it spreading to everything in your yard, though it will likely spread to plants of the same type (from one tomato bush to the next, for example). Pruning and spacing plants to promote good air circulation will help them dry off more quickly following rainfall and can reduce leaf spot problems. 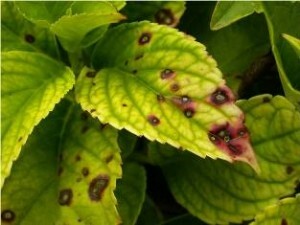 Removing spotted leaves from plants will help slow the spread of the disease but will not cure it. Hydrangeas often develop leaf spot in late summer following rainy weather. Like many leaf spot diseases on ornamentals, this problem is mostly cosmetic and usually does not require spraying. Fungicides can be used to control leaf spot diseases but are not always needed. There are numerous types of fungicides available, including several organic options, but which is the right one to use will depend on the disease you are trying to manage. If a plant in your yard develops leaf spot, bring a sample or send a picture to your local Extension office for identification and recommendations on how to control it. If the older leaves on your plants are simply turning yellow, with no spots, they are most likely showing symptoms of nitrogen deficiency. Nitrogen leaches out of the soil rapidly with heavy rainfall, leaving fast growing plants like flowers and vegetables hungry. If the plants in your garden are losing lots of yellow leaves, you should fertilize with a slow release or organic fertilizer to replace the nitrogen lost in recent rains. In addition, watering plants with a liquid fertilizer such as Miracle Gro or compost tea will help them recover faster. Plant roots need oxygen to survive, especially the tender root hairs that are responsible for absorbing water and nutrients from the soil. Oxygen exists in soil in the small air spaces between soil particles. When these spaces fill up with water, delicate root hairs drown. As a result plants wilt, particularly during the heat of the day. This is often a temporary problem, and plant roots are able to recover as long as the soil dries out within a day or two. 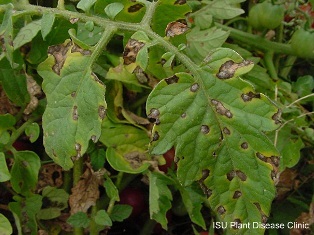 The recent hot and steamy weather has created the perfect conditions for southern stem blight, a disease that attacks many vegetables and flowers. Tomatoes, peppers, beans, purslane and hosta are especially susceptible. If plants in your yard begin to wilt, be sure to inspect the lower part of the stem at soil level. 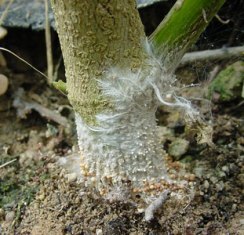 If you can see a white, cottony film covering the stem and surrounding soil, your plant has southern stem blight. There is no way to treat or eradicate this disease, which persists in the soil from year to year. Do not add infected plants to your compost pile as this will only spread the disease. Plants resistant to this disease include ornamental grasses, lawn grasses, and corn. If you have questions about garden problems, contact your local Extension office. If you live in Pender County, call 259-1235. In New Hanover County, call 798-7660. In Brunswick County call 253-2610, or visit https://www.ces.ncsu.edu/ where you can post your questions to be answered via the ‘Ask an Expert’ widget.